Heater Hoses Manufacturer, Heater Hoses Manufacturer in Pune. 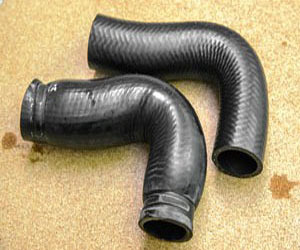 Heater hoses are rubber hoses found on virtually all vehicles equipped with internal combustion engines. Their main purpose is to transport coolant from the engine to the heater core located inside of the vehicle. They are often premolded into specific shapes, or cut to specific lengths in order to accommodate the setup of the vehicle’s cooling system. They are usually located at the rear of the engine, near the firewall, connected to the heater core outlets, or the heater control valve. Automotive cooling system hoses are made of heavy duty materials, and are designed to withstand exposure to the heat and chemicals of the engine’s coolant.